Fabless semiconductor company Mediatek has unveiled a new 64-bit system-on-chip called the MT6732 which is 64-bit capable, thanks to its Cortex-A53 V8 architecture, and comes with an integrated LTE modem. Clocked at 1.5GHz, it will have four cores and will be manufactured on a 28nm node. As far as performance is concerned, we've been told that it the Cortex-A53 is roughly equivalent to the Cortex-A9. 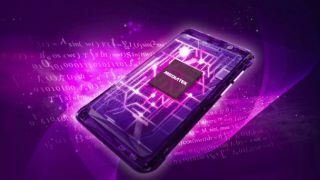 A spokesperson for Mediatek confirmed that the first devices based on that SoC would be launched later this year, most possibly during the last quarter of the year, a few months after its 32-bit, octocore SoC, the MT6595, appears in devices. Both devices will have a Cat 4 FDD and TDD LTE modem and the 6732 will feature an ARM Mali-T760 GPU. The 64-bit model however will be pegged as a no-frill mainstream solution while the 32-bit one will be pushed as the high end model complete with bells and whistles (Rogue GPU, 4K support, NFC, etc).